UDM Downloads > ID Executable Password! 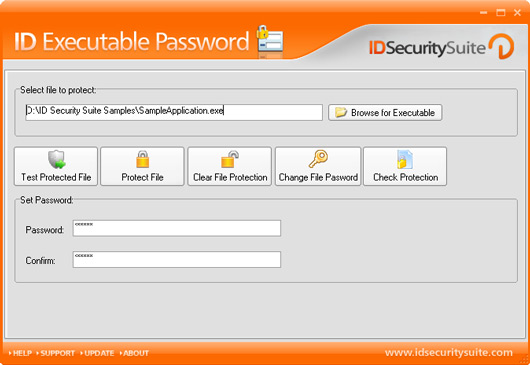 ID Executable Password is a program meant to protect by the use of a password all Windows executables. It modifies the content of the existing .EXE files so they cannot be accessed without a correct password selected or modified by you only. Main Features: - Secures under password all Windows executables - Prevents unauthorized access to the programs - Provides direct Internet links for upgrades - Protects against network intruders - Tests protected computer applications Detailed features: - ID Executable Password protects all of your personal programs and applications, by the use of a secure password set by you. It allows you to choose and modify that password in order to maintain your privacy. - Incorporates password protection directly into the .EXE file, modifying its content and making it impossible to be accessed by anyone else. It supports both 16-bit and 32-bit executables. - Checks selected executable files at your request to search for already protected ones. It also keeps you informed and aware of secured programs and the ones you can set a password protection for. - ID Executable Password works with any network configuration, providing protection against all network users, as well as ones directly using your PC. - Tests at your request any computer application. ID Executable Password runs programs inside itself for an easy program testing and does not run in the background in order to provide its functionality.- ID Executable Password has an easy to use, convenient graphic interface which requires minimal space on your disk to operate and run efficiently.